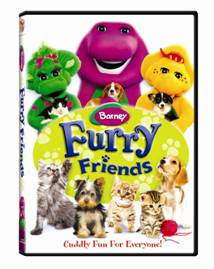 It’s a whole litter of fun with preschool favorite Barney & Friends™ in this all-new collection of “tails” about how special our furry friends can be with Barney™: Furry Friends on DVD July 27, 2010 from Lionsgate and HIT Entertainment. Trusted by moms and adored by children, Barney displays sharing, caring, imagining, dancing and learning on television, online and through live events, home entertainment and publishing. The Emmy® award-winning series, Barney & Friends™ is one of the top-rated preschool shows today, airing on PBS KIDS® and Sprout®. Join Barney, Baby Bop™, BJ™ and all their playground friends for some tail wagging adventures as they learn about dogs and cats. From helpful guide dogs to feline family members, you’re sure to have warm-hearted fun in this very special doggie treat. Find a lost cat, dress up and learn about tigers, meet neighborhood dogs Bingo and Pilgrim, join in for a rousing round of B-I-N-G-O and be a judge at a fun-spirited dog show! *Follow me @jamaise at Twitter & Tweet this : RT @jamaise #GIVEAWAY #WIN - a copy of Barney ~ Furry Friends on DVD @ Wishing Penny http://bit.ly/dds7gd Ends 8/13 tweet each day for one entry each ! I would love to win this for my little girl. Follow on GFC. My little Major would LOVE it! My daughter LOVES Barney! Right now she's watching Barney's "Let's Make Music!" The little girl in my life that would watch this (and I'd watch it with) is the 2 year old girl I babysit for. Thanks! My 3yo would love this. I follow your blog and my niece would enjoy this. Thanks. My youngest son is 3 and he would really like this. I have 4 little nephew and nieces who would jump for joy for this prize.